Death on the Diversion is the start of a brand-new cozy mystery series. She realizes she knows a whole lot more about the interactions of the victim and suspects than the ship’s officials do. She’s drawn into sleuthing, but finds herself hampered by a well-meaning but overprotective would-be Doctor Watson. On the spectrum of Patricia's mysteries, the Caught Dead in Wyoming series is in the middle, Proof of Innocence is a bit edgier and Secret Sleuth is a bit less edgy. In the best kind of time travel – no uncomfortable time warps or bizarre closets to step into -- I’m about to take you to a particular moment in my life, in my history. At this moment in time, I’m walking circuits on the deck of a cruise ship called the Diversion on its two-week repositioning cruise from Barcelona, Spain to Tampa, Florida. I’m being passed by runners, joggers, and faster walkers. That’s all fine with me. I’m enjoying the air and the sun and the peace. Thinking about the past fifteen years. Wondering about the next fifty-plus. I’m about to find a dead body. Sheila M. is not the name you might know me by if you read a certain kind of book, listen to a certain kind of interview, watch a certain kind of TV talk show. Or if you were not in a cave protected from all news about blockbusters – book and movie -- fifteen years ago. But Sheila Mackey is the name I’ll use in the life that this story leads to, so I might as well start now. Besides, I’m leaving that person with the name you might know behind. For good. This moment in time I’m taking you to occurred while I was transitioning to my current circumstances and transitioning from the life I’d lived the previous fifteen years. Contrary to what most might guess, that past is the boring part. So, let’s get it out of the way. Back when I was finishing college, I said yes to a job offer. No big deal, right? It’s what the lucky graduates do after college. My friends said yes to job offers with tech firms, oil companies, charity foundations, and the FBI, among other things. I said yes to my great aunt. At that point, Aunt Kit – we left off the great most of the time -- had been a working fiction author for more than thirty years after a brief stint in journalism. She’d written mysteries, science fiction, romance, horror, westerns, and more. She’d written under her name and five pen names. She’d ghost-written for several celebrities. She’d supported herself with her writing all through those years. Nothing grand, just, as she would say, a working stiff mid-list author. Then she had the idea for Abandon All. A departure for her. A book that bridged the commercial and the literary. A book with huge potential. A book no one in publishing would buy from her. That’s not a proven fact, since she never submitted it to any publishers. It was a conclusion she drew from decades of experience in the business. For this book to reach its potential, she told me during that strangest of job interviews, it needed to have been written by a young, attractive woman from the Midwest. Which she was not. At least not any longer. There was a good deal more discussion, but the bottom line is that I said yes. I was, after all an English major with an undergraduate degree and no idea what to do next. I would present Abandon All as my work. If it drew interest from publishers, Aunt Kit would front the money for a trip to New York for both of us. There was an auction for the right to publish the book – that’s where publishers bid against each other, though there’s no fast-talking auctioneer with a gavel -- that had my head spinning in a way that relegated Linda Blair’s The Exorcist scene to amateur hour. Abandon All was not just a hit, it was a phenomenon that became a cultural icon. The day an interviewer called it this century’sTo Kill a Mockingbird, I thought I’d faint right there on the TV set. The movie was even bigger. In less than a year, Aunt Kit and I moved into a brownstone on the Upper West side. She paid for it outright. Over the rest of the fifteen years, my name, face, and voice remained the public front for Aunt Kit’s writing. She wrote eight more books for that persona – me. (Sometimes I forgot it was me and think of that person as separate.) None reached the Olympian heights of Abandon All, but they did fine financially. She paid me thirty-five percent of the author’s earnings – saying I did more for those books than the agent, who took twenty percent off the top – plus provided my housing, “author” clothing, food, and transportation. Perhaps more important, she oversaw the investing of my money. Aunt Kit was careful and shrewd. She also wrote another twenty-five books in her old genres for “fun” and published them independently. That income was all hers, as it should be. Though she’d argued with me about that, focusing on the brainstorming I’d done with her for all the books, but particularly the mysteries. I’d argued back that it was fun for me. She stopped arguing, which meant she planned to see that I got that money one way or another anyway. For “the other” for which I did accept compensation, I did appearances, I spoke at literary events, I walked red carpets, I offered writing advice (culled from Aunt Kit), I was videoed and photographed. I gave interviews. No one except the two of us, my parents, and siblings knew I wasn’t writing the books. To the outside world, I was offering a home to my aging relative, instead of vice versa. I’d said yes on a lark. I ended up being tied to a lie. Then, six months ago, she said she was retiring. She might continue writing her fun books as she felt like it, but she was tired of the literary pretentions Abandon All had taught readers and critics to expect when my name was on a cover. She – she was always kind enough to say we – had earned enough and under her guidance we were both set for life. Plus, there’d be ongoing royalties. She’d bought a place on the beach in the Outer Banks of North Carolina, which I was invited to visit at any time, but was not to be my home. She was pushing me out of the nest. This cruise was a cushion for my landing. Aunt Kit’s idea for a lowkey farewell performance as the name you’d probably recognize, though no one else knew it was a finale. One good thing I’d done at the start, more out of a kind of shyness than smarts, was to use one of my middle names and my mother’s maiden name -- also Kit’s last name -- on the books. That left me other parts of my legal name to use in my new life. Not wanting to return completely to my pre-Abandon All name, I decided on Sheila Mackey, taken from pieces of other family names. As for the “author” of Abandon All… Time would pass without a new release. If enough questions were asked, a statement would be made about retirement and the desire for privacy. The word recluse might pop up. If it added to the sales of the existing books, we wouldn’t complain. So that was me, walking around the ship, in mid-air after the push out of the nest. Would I fly? Would I crash? Step one: Figure out how to flap these things sticking out at my sides. Step one: Figure out how I got blood on my hand from touching the woman wrapped up in the beach towel. How’s that for a start on a new life? Bloody woman and I’m about to become a sleuth with a secret. 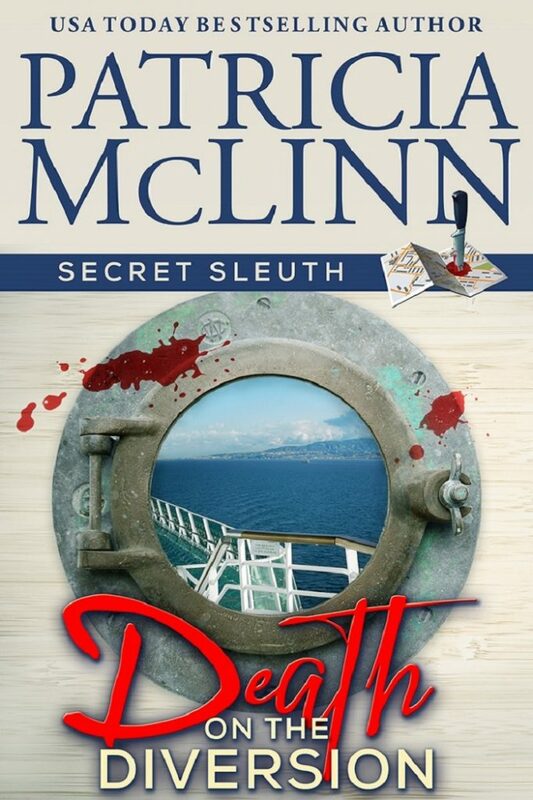 It all started when those words floated up to us as Petronella and I walked onto the cruise ship in Barcelona six days before the woman stopped breathing and I became a sleuth with a secret. I need to explain about Petronella. Possibly about a single woman in her mid-thirties taking a two-week transatlantic cruise, too. Petronella was the daughter of Kit’s long-dead fiance’s cousin from his mother’s side. Welcome to Kit’s world. I got to the point where I referred to everyone as Kit’s relative. It made it easier. Though it did confuse our Guatemalan housekeeper at the brownstone when I introduced her as Kit’s relative to a visiting acquaintance. It – the woman in the lounge chair -- started well before I found her dead body. If I were Sam Spade, I’d say it started days earlier when the dame walked onto the ship. And that would be true — from my POV. POV is author talk for point of view – which character is steering the bus for that part of the story, so the reader experiences it through his or her mind and senses. From the point of view of the woman dead in the lounge chair, it started much earlier. At some point in her life when seeds took root that grew into someone killing her. But for me, it started with that voice carried on an air current up the boxy zigzag of the gangplank. I looked over the railing to the series of switchback ramps below us that created an easygoing gangplank for the Diversion. Fellow passengers strung out behind us among the early arrivals that Sunday afternoon. A daisy chain of gray heads interspersed with determinedly not gray heads and sunhats, male and female. No telling where the words came from. Not even a hundred percent sure a woman spoke them. More like sixty percent. Maybe fifty-five.And what did it matter? We’ve all said the same thing how many times in our lives? Except something in the voice made me look. Then I forgot about it, because it was our turn to be welcomed onto the ship. And there, in the background was a young woman dressed in the crew uniform of crisp white shirt with insignia and nametag over navy slacks, holding balloons and a sign bearing Petronella’s name. The tears in her eyes apparently stopped up her hearing, because she didn’t relinquish her panicked horror as I dragged her toward the smiling young crew member. I didn’t say that aloud. I thanked her for both of us, took the envelope and yellow balloon, and dragged Petronella out of the mainstream of boarding passengers. I ripped my envelope open. She shook, tears sliding down. When you embark on a cruise, your main luggage is whisked away to appear outside your cabin door at some point in the future. All very nice, but that point in the future frequently ends up being unpredictable. Even at its most efficient, you have time to spend while the magic happens. Kit had taught me to carry a go-bag to bridge any temporary luggage gaps. It had all the necessities for several hours of relaxation, from sunscreen and sunglasses to reading material and headphones to a few munchies and the thermos of cold water Petronella had insisted on filling for me. But I wouldn’t need it quite yet, since Kit had kindly arranged that some of our waiting time would be spent on manicures. “Are you sure? Maybe this envelope…”Petronella brought out the worst in me. I so wanted to say, Yeah, you’re probably right. Kit sent me a balloon and a manicure, but you she sent a balloon and the news that one of your nearest and dearest has died. While she did, I attached both our balloons to a nearby railing – railings are nearby almost everywhere on a cruise ship. With still-shaking hands she removed the card. “Oh. It’s for a manicure,” she said in astonishment. The spa receptionist’s whispered words to her co-worker were banished by a perfect, professional smile. She-devil? Had I heard that correctly? It seemed such an unlikely word, especially in the bright and shiny spa of the Diversion. Certainly, I wasn’t supposed to have heard it – if that’s what I did hear – but I have very good hearing. This smiling young woman wore the uniform of the ship’s spa. She had an Eastern European accent and a firm hold on Petronella’s arm. Kit had her reasons for this arrangement. Something Machiavellian? Or, more altruistically, to spare me? To spare the rest of humanity using the facility? Though what it was going to do to the smiling young woman, I couldn’t imagine. At the moment it was moot, anyhow. Petronella wasn’t budging. A chorus of “Oh, no, I couldn’t possibly…” instantly followed by chuckles interrupted you. According to Kit, this distant relative of her long-dead fiance had been Poor Petronella since she was old enough to display a personality, which came later than most kids. If there was a mishap floating around, Petronella reached out and grabbed it like the last life jacket on the Titanic — sorry, probably not a good image when I’m talking about cruising. But it fits. Her latest misfortune was getting a divorce from the husband who’d been abusing her mentally, physically, and emotionally since before they were married. Yes, before and she still married him. You should hear Aunt Kit on that topic. But then how was the divorce a misfortune, you might ask. You and me both. To Petronella, however, it was a tragedy of epic proportions. Her kids, who loved her for reasons beyond explanation but with the sane caveat that they lived in distant time zones, had begged Aunt Kit to beg me to help her. They’d thought I would pay for the cruise, while Kit would have soulful, reasonable talks with Petronella. Instead, Kit paid for the cruise, then bailed on both of us. “You must go in the room to be happy and for your giver to be happy,” said the mahogany skinned young woman who’d said she would be doing my nails. South African accent, I thought. She put one arm across Petronella’s back and the other on her forearm and simple walked forward, scooping along the recalcitrant client. In less time than I could have imagined, Petronella was in a room off the hallway and the door closed behind her. “Do not worry. Your relative will be very fine,” said the young woman with the name tag saying Imka. “Very true.” Though Petronella wasn’t that old. Chronologically. She waved me to an open area with floor-to-ceiling windows angled out at the top, so if you wanted to look almost directly below, you could by leaning out. But why would you want to? Two chairs in white leather that appeared to be crossbreeds of recliners and airline pilot seats had the best views of the windows and the blow-out stations, hair dryer chairs, and the hallway to the other treatment areas, depending on which way you swiveled. One was occupied by a woman around Aunt Kit’s age. She had mostly gray hair, with enough variation at the back to show it had once been dark brown. Laugh lines waited for employment at the corners of her mouth and eyes. They flickered when she smiled, polite but not intrusive, as I was directed to the other chair. “I’m afraid you have a remedial case here,” I said to the nail technician named Imka. I’m not the best about getting regular manicures — something the publicist reminded me of each time I had a TV appearance — but never far enough ahead of time for me to actually get a manicure. Just enough to make me feel insecure about my long, too often raggedy nails. I wished that were true, since that promise seemed to cover more than nails. The older woman met my gaze and her laugh lines deepened, indicating she’d had the same thought. I said hello. She did the same. She introduced herself as Odette Treusault. I gave my name – the one known as the author of Abandon All. She looked at me intently for a moment, then gave a small nod and carried on as if she hadn’t recognized the name. She had. Neither of the nail technicians had. Quickly, I learned that Odette had been on this ship many times and knew both of these nail technicians. She and I and Imka and her technician, Bennie, chatted about cruises, cruising, the schedule ahead of us, and excursions. When Aunt Kit ran the show, we seldom joined the excursions. If she was deeply interested in a stop, she’d hire a driver and guide to see precisely what she wanted to see. Otherwise, we tramped around the town, poking our heads in to interesting corners, gathering a sense of the place along with a string of factoids, and people-watching. Always, always people-watching with Aunt Kit. As I said the words, another phrase repeated in my head. When Aunt Kit ran the show. But she wasn’t running my show anymore. I was. I could – I had to – decide for myself. “I’ll have to check them out.” The excursions were a couple days off, when we berthed three days in a row at three ports in the Canary Islands. All four of us stopped and turned toward the noise coming our way. Five women strode into the area, like a formation of attacking jets, their voices raised, long hair flowing, skinny legs shrink-wrapped in capris, foot-breaker heels clacking. Though that wasn’t really what I noticed first. Let’s just say enhancements. On display. Almost completely on display. Amateurs and professionals at what? “You won’t have any customers after this. Ever. I’ll see to that.” She swept on into the room. “And send someone to me, as well,” said the next one, with hair nearly as dark, a mouth nearly as wide, and teeth nearly as white, as she went in to the next room. “And to me,” a redhead on her other side said, streaking down the hall to a third room. The slightly less blonde of the pair piled into the blonder praying mantis with a shoulder to her diaphragm, applying a technique that few females who grew up without brothers managed. It shut off the stream of words. More, it carried both of them toward the windows. The four of us – Odette and I in the chairs, Imka and her fellow nail technician on the stools in front of us – froze in place. The hitter pulled up, digging her heels in hard enough that she stumbled to the side. The hittee kept sailing backward toward the windows. A little over a year ago, I walked past a woman wrapped in towels on a deck chair of a cruise ship and wondered what if. That’s how it started. 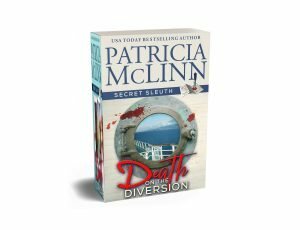 Now you can get Death on the Diversion in both ebook and paperback versions. In Death on the Diversion, Sheila Mackey’s on a transatlantic cruise as a transition from the role she’s played for the past 15 years. It’s supposed to be a relaxing two weeks. But an overly grateful sort-of-relation, tensions among the crew, and complicated relationships among some of her fellow cruisers all draw Sheila into drama. And then she walks past a woman wrapped in towels on a deck chair who’s not moving. All at. Not even to breathe.